David Meerman Scott has recently published the Fourth edition of his excellent book on how the Internet is rewriting the rules of business. I have read his last three editions so I was keen to read his updated version. This is what struck me this time round. 1. Marketing is an action word and not a noun. The book is full of practical examples from all areas (it even includes the American Presidential election as an example). Marketing actions are often led and organised by ‘professional’ marketeers but the best content is being produced by the professionals in that area. 2. Marketing is not about Jargon. David actually published the Gobbledygok Manefesto back in 2006, highlighting words such as innovate, best of breed, world class which have become meaningless through overuse. If you could replace your Company’s name with one of your competitors in your promotional material and it still makes as much sense, it is meaningless. 3. The new world of marketing is still evolving. David Meerman Scott does a very thorough revision of his books with each new edition and rereading previous releases is like a journey back in time as new ‘hot topics’ appear and yesterday’s big thing disappears. Anyone remember Second Life? (which still gets a brief mention). He goes into detail about which options may suit which groups. 4. Lots of people are still getting it wrong. There are lots of examples of doing things wrong as well as doing things right. The book is full of non-technical explanations, ideas, examples and suggestions to try and ways to measure success so that you can get it right. 5. Content really is king. You can spend ages trying to game the search engines, but writing material that people want to read and will pass on is the best way to market you and your Company. The important thing is to inform and not just to sell. 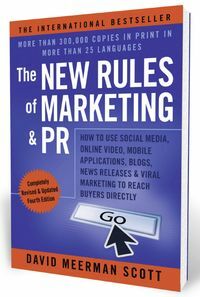 I found it a very easy book to read and recommend you try it, if only so that you can understand all the jargon that old school marketers may try to bamboozle you with….